CALL IT the number 10, describe it as the false nine, even pinpoint the position as operating in the hole. Regardless of the labels, Paul Cook’s attacking system is clearly suiting Adam McGurk, Marc McNulty and Caolan Lavery. Against Accrington Stanley on Saturday, McNulty was largely the lone striker – with McGurk behind as the central part of the attacking-midfield three. The result was the Ulsterman claiming the decisive goal and Scot McNulty providing the assist. Previously, in the 2-2 draw at Wycombe, Lavery was the striker, McNulty dropping short and McGurk in a wide role. Even in McNulty’s hat-trick match against York last month, Lavery was further forward in the 4-2-3-1 system Cook continues to favour. 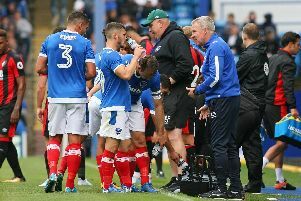 With Matt Tubbs still sidelined by injury, the trio have been presented with the opportunity to stake their claim in Pompey’s system. Their roles many be difficult to pin down during analysis. Nonetheless, it is proving effective of late. McGurk said: ‘Against Accrington it was alternating, with one playing high and one playing short. ‘There is no set position, really. It is just whoever is closest in the position. ‘Sparky (McNulty) knows how to play both so we just take turns. It sounds more complicated than it actually is! ‘It’s about getting an understanding. You just know where your team-mate is and where the ball is, it’s a link developed from playing a couple of games with each other and knowing what each other likes to do. ‘It definitely works and, in fact, the whole front four can rotate. ‘If Benno (Kyle Bennett) goes past me or Sparky, we have to go and cover for him whenever we are getting counter-attacked. ‘Otherwise, he is going to be worried about making runs forward because he can’t get back to help defend. ‘There has to be a bit of rotation for some of the players and that is what we have tried to do. ‘It has been here since the start of the season, but I don’t know if everyone has noticed it. ‘Even when I have played up front before, I’ve always ended up at the right at times or the left at times – you are just covering other positions. McGurk’s first-half goal was his sixth in 15 matches for the Blues following his summer arrival – and fourth in cup competitions. Meanwhile, the two loanees of McNulty (four) and Lavery (three) have also been among the goals, having served in Cook’s system. Yet it is Saturday’s match-winner who finds himself joint-top of Pompey’s goal charts along with Conor Chaplin. McGurk added: ‘I will play anywhere the manager wants me to play. If I have to play wide, I’ll play wide. ‘Obviously, I have played up front for the majority of my career so that is a bit more natural for me.